The KITCHEN is equipped with a gas stove with 4 burners. The fridge is big and spacious with freezer. There are countless drawers and shelves with good kitchen supply and in addition a toaster and a kettle. The LIVING ROOM is really spacious with a corner sofa, a flat screen Smart TV, shelves with more than 100 books in various languages, (English, French and German). There is also a couch that turns into a single bed for the third person. The living room is equipped with air-conditioning not included in the price. The cost of the electric power is Euro 0.20 per kWh detectable from an electricity meter located near the air-con unit. The BED ROOM has a comfortable double bed (1.80 meters), a large wardrobe and a flat screen TV. Sheets, pillowcases and 4 pillows are provided. The BATHROOM has a bathtub, a sink, a bidet, drawers and shelves. Hair dryer and 3 towels per person are provided. The TERRACE with a view on the Amalfi Coast bay is equipped with 2 deckchairs, a table with a hand-painted ceramic top and 4 chairs. If you decide to come with a car, just at about 50 metres from the stairs that lead to the apartment, there is a private garage free of charge. From the main road, as mentioned previously, you reach the apartment climbing about 60 picturesque stone steps. The houses of this area are scattered along a narrow road cut into the sloping coast all facing the sea and the sun, separated by thriving vegetable gardens. Here the authentic villagers lead their life with quiet rhythm and without crowds of tourists. Conca dei Marini is the perfect starting point to visit all the most famous tourist sites of the region as the beautiful “Grotta dello Smeraldo” (Emerald Grotto) as well as Amalfi, Ravello, Positano, the islands of Capri and Ischia, Paestum, Sorrento, Pompeii, Herculaneum, Naples. We had a wonderful five-day stay at the Amalfi Coast House in September, with the highlight being the stunning views enjoyed from the comfortable and spacious terrace. The host Raffael was very generous with his time, meeting us from the bus stop and showing us around the village on route to the apartment. He also helped us to book various excursions to the beach and nearby towns. The apartment was clean, the bed was comfortable, shower was great and in the evenings there was even Netflix available on a large TV. The village is peaceful and beautiful, much quieter than Amalfi, and has everything you could ask for for a relaxing holiday. We really enjoyed it and would happily come back. Amazing views, clean and spacious apartment and the most gracious, helpful host Rafaelle! My family had a really amazing time in the Amalfi Coast and this is in large part made possible by the great stay we had at the Amalfi Coast House in the beautiful town of Conca Dei Marini. The apartment was perfect for our family - I went with my hubby and our 2 girls - almost 2yo and 7 months old. There was an extra bed and a cot was provided for us too! The terrace had a stunning view and this is where we had all our meals. There was air conditioning for when it got too hot, a parking garage for our car and most important of all - Netflix! A small shop which provided necessities and a great restaurant were both within walking distance. Rafaelle, our host, went over and above to make sure we had an amazing time - showed us around, made reservations for us at Le Bonta del Capo (we didn’t speak Italian), kindly took out our trash for us, and was available and responded very promptly to our queries. 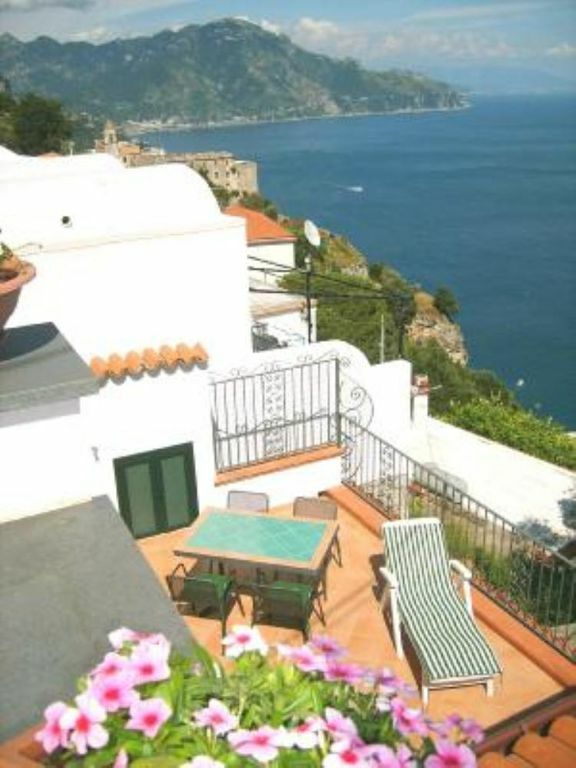 We can’t wait to be back and highly recommend staying at Amalfi Coast House! The apartment is comfortable. The rooms are plenty big and certainly functional. The view from the terrace is awesome and just sitting there was very relaxing. The hospitality of Raffaele was what set this property apart. He met us and showed us to the apartment, gave us some time to settle in and then took us on a tour of Conca including a stop at the market to pick up necessities for our stay. We were also introduced to the mayor who was at a roadside restaurant and to the chef at a wonderful restaurant with great views of the sea. During the stay, he helped us with reservations at a private beach and with figuring out transportation to Amalfi. If visiting Conca dei Marini, be prepared to walk up hills and stairs as that is necessary no matter where you are going in the village. But the friendly, small village vibe with gorgeous views makes it well worth the effort. Raffaele was an amazing host. He went above & beyond to help my daughter & friends navigate around Conca Dei Marini and up & down the Amalfi Coast area. The view and patio were fabulous. The room was exactly as anticipated. Raffaele even stopped by to check on them during their stay to see how everything was going. We would recommend this property without any hesitation. The host responded to all queries promptly before and during the stay. We arrived via public transport and he came to meet us at the bus stop not only to help with luggage but to give us a brief tour of Conca dei Marini and to show us some stunning views of the coast. (He even negotiated a discount for the private beach). The apartment is nestled into the cliff, so this means that steps are inevitable. The price paid in steps was well worth it for the breath-taking view from the private terrace. The apartment was very clean and had all you could need. We appreciated the well-considered extras, such as the phone charge points by the bed and an electric kettle (a rarity in Italy). We used Conca dei Marini as a base from which to explore much of the coast; buses are cheap and frequent and Amalfi is only 2.5km away. While we loved each town that we visited, we were always happy to leave the crowds behind and return to the tranquility of Conca dei Marini which afforded a rare insight into "real Italy". It has 2 restaurants as well as a small supermarket, chemist and the "Bazar" which stocks just about everything. The people we met in Conca were all very friendly and we even got a lift down to Amalfi which seems to be the norm - cars just stop if you are waiting for a bus and offer you a ride. Gorgeous view and amazing host! We would highly recommend this apartment. The apartment was very clean, loads of space, comfortable bed and a fabulous deck with spectacular views. Raffaele could not have been a better host. He was very helpful with recommendations and drove us into Amalfi a couple of times. We tried out one of the nearby restaurants and loved it. There is also a handy market close by. It was very nice to be a little bit away from the very busy Amalfi. We had quiet nights that we really appreciated. If you are driving from Rome or Naples, take the motorway A3 in direction of Salerno; exit "Castellammare di Stabia" and follow signs for “Costiera Amalfitana”; take SS336 direction Agerola; after Furore, on the way to Amalfi, you find the village of Conca dei Marini. If you are driving from the South, take the motorway A3 in direction of Salerno; exit “Salerno Centro/Costiera Amalfitana”; take SS163 (Strada Statale Amalfitana); go over the town of Amalfi and at the crossroad take the road to the right, direction Agerola and follow straight on the road SS336 till Conca dei Marini.